I’ve had this one Covergirl lime green eyeshadow for months now but haven’t had a chance to wear it. I have admired the shade since I got it, but with lime green, it’s kind of hard to find a place to wear it. It’s too bold for the office, not as sultry for a night out, and too bright for a casual night in. When I got tickets to see P!nk last week, the first thing that popped in my mind was the eyeshadow. Yes, I had my makeup chosen before my outfit #beautybloggerproblems. For this tutorial, I refined the look a bit more and added a few more steps. Of course, all you really need is a matte black and a green eyeshadows. I did use a green base so the colour would look more vibrant, but you could always just pack on the eyeshadow, or use a white base. Here’s how to recreate it. 1. Lay down an eyeshadow primer, I used Too Faced Shadow Insurance. After, fill in your brows. For this look, I used Buck from the UD Naked palette and an angled eyeliner brush. Then, with a matte white shadow, apply this to your brow bone to highlight. I used 00 from the Make Up For Ever Technicolor Palette. 2. Moving down from the brows, apply a matte light brown shadow right underneath the highlight and above the crease. This acts as your transition colour. I used Naked from the UD Naked palette. 3. Apply a cream green eyeshadow all over the lid area. Apply the cream shadow first to act as a base and to make the powder eyeshadow appear more pigmented. I used Make Up For Ever Aqua Cream in 52. Note, MUFE Aqua Creams dry fast, so if you use this one, work fast and do one eye at a time. 4. Go over the cream eyeshadow with your green powder eyeshadow, packing on the colour with a flat shader brush. I used Covergirl Shadow Pot in 310. 5. With either a gel eyeliner or a liquid eyeliner, line your upper lash line with an exaggerated wing. I used Rimmel London ScandalEyes Gel Waterproof Liner in black. 6. With a matte black eyeshadow and a pencil brush, lightly line from the wing inward along your crease, creating a cut crease. Take your time with this and build the colour up. I used MAC Carbon eyeshadow. 7. With a crease brush, like MAC 217, lightly blend the black out along the outer edges. 8. Curl your lashes and apply mascara. I used Covergirl Lash Blast Clump Crusher mascara with Yves Rocher Volume Vertige over top. 9. 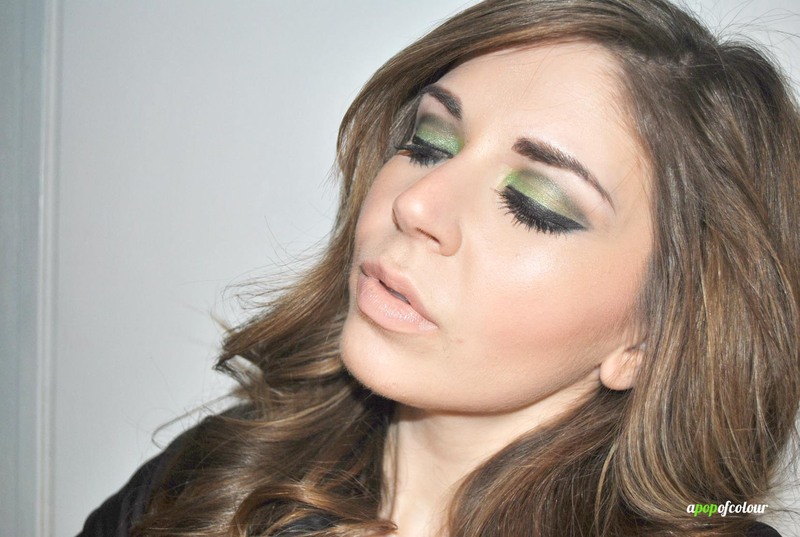 Using that same green cream eyeshadow, line your lower lash line. 10. With the matte black shadow, line the outer edges of your eyes creating a gradient effect between the green and black. From there, line the outer corner of your waterline with a black pencil liner and then apply mascara to your lower lashes. For the face I used Marc Jacobs Beauty Genius Gel foundation (I picked up a sample at Sephora to try out), IT Cosmetics Bye Bye Undereyes in Neutral Medium, Benefit Hoola Bronzer, Rimmel London Stay Blushed Liquid Cheek Tint in Peach Flush, IT Cosmetics Hello Light Illuminating Powder, and Hourglass Dim Light powder. For the lips I used MAC Myth with NYC Big Bold Gloss in Big City Blush over top. Pair this look with big, voluminous curls, a leather (or faux!) moto jacket, and you are ready to rock out! Let me know if you try it out! Also, how to you wear green? 1 Comment on Rock chic! You look great! Your hair is gorgeous. That MUFE green Aqua Cream is so pretty.